This electrode is used to join duplex stainless steel base material containing approximately 25% chromium. 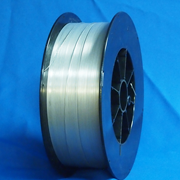 This alloy is in one of the family of duplex stainless steel alloys. Has improved resistance to pitting corrosion and stress corrosion cracking. Following the chemical composition designation comes the letter “T” which signifies that the product is a flux cored electrode or rod. Following the “T” is a “1” or “0” indicating the recommended position of welding. The “1” or “0” following the “T” designates the following: “0” – designed to weld in the flat or horizontal position, “1” – designed to weld in all position. Following the position indicator and a dash, are the numerals “1”, “3”, “4”, “5”, or the letter “G”. The numerals “1”, “4”, and “5” identify the shielding gas required for classification of the electrode. The number “3” signifies that an external shielding gas is not employed. The letter “G” signifies that the shielding medium, chemical composition and mechanical properties are not specified.